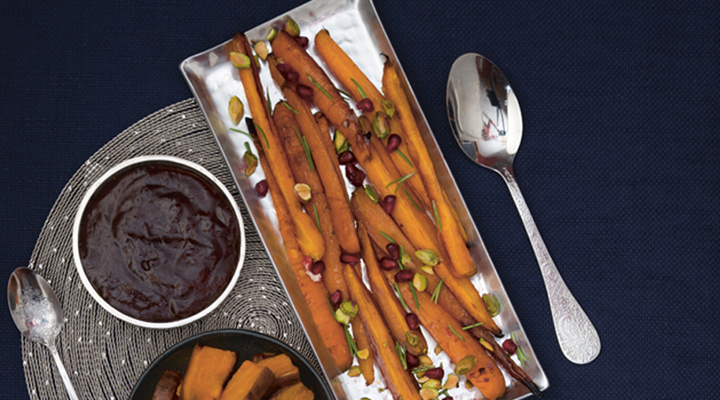 Give your carrots an extra boost of flavour with delicious pomegranate and pistachios. Slice the carrots lengthwise into four long strips so that they are long thin wedges. Put the wedges in a large mixing bowl. Put the oil, maple syrup, balsamic vinegar and salt in a small bowl and whisk together using a fork. Pour the dressing on top of the carrots and mix until all the carrots are completely coated. Spread the coated carrots on the lined baking tray. Roast in the oven for 45 to 60 minutes, until they start to crisp up and char, but keep an eye on them so they don’t burn, as sugars can catch quite quickly. While the carrots are in the oven, it’s time to deseed the pomegranate and toast the nuts. Cut the pomegranate in half through the equator, not the stems. Hold one half in your hand over a bowl with your fingers spread open to allow the seeds to fall through. Use the back of a wooden spoon to bash the top and the seeds will fall through your fingers into the bowl. If you spot any white bits in the bowl, remove them, as they are bitter. Give the pomegranate halves a good squeeze into a glass to get all the juice too. Drink the juice as a little bonus for the cook! Toast the nuts by putting them in a dry frying pan without any oil. Set on a high heat and cook, stirring regularly, until they start to turn golden but not burn. This should take 5 to 8 minutes and you should watch them like a hawk. Sip your pomegranate juice to pass the time! Once the carrots are done, transfer them to a serving bowl and scatter the pomegranate seeds and toasted nuts on top. Finally, sprinkle the fresh thyme or rosemary leaves over to finish.